Fiction – paperback; Scribe; 275 pages; 2011. Review copy courtesy of the publisher. It’s been a long time since I’ve read what I would term a “domestic novel”, one that concentrates on marriage, family and friendship. It’s not that I have been avoiding these types of stories, it’s just that everything I have picked up lately has been focused on bigger, more “worldly” themes. And yet there’s something universal about the domestic novel, something with which we can all identify, that I enjoy reading. We all live in households, are in relationships, and it is here, in our private realm, that most of our personal dramas, traumas, tragedies and triumphs take place. And no one household, or family, is the same as another. Here, then, is a rich seam of material for the novelist to mine. Australian writer Peggy Frew does just that. She sets her debut novel, House of Sticks, in what appears to be the rather cosy domestic world of suburban Melbourne, but — just like the house of sticks of the title — the fragility of the marital home is threatening to fall apart. Bonnie is 34, her partner Pete is 42, and they have three children — four-year-old fraternal twins Edie and Louie, and five-month-old baby Jess. Pete is a furniture maker who works from home and Bonnie has given up a successful music career as a guitarist in a rock band to be a stay-at-home mum. But their happy household is rife with unspoken tensions, compromises and resentments. These come to the fore when Doug, an older school friend of Pete’s, insinuates himself into their lives after a year’s absence. He’s a drifter with no real home, no income and no responsibilities — Bonnie describes him as a “lost soul” — so Pete employs him to do odd jobs in his workshop. But there is history between them. (Doug once worked for Pete and cocked up an order that left Pete substantially out of pocket. And Pete puts up with Doug out of a sense of misplaced loyalty — and guilt — resulting from a violent incident which happened in their youth.) That history, however, does not apply to Bonnie, and she finds Doug’s presence worrying and creepy. Effectively, Doug makes Bonnie feel uncomfortable in her own home. If she’s been out and returns to see his van parked in front of their house, she will drive off again and occupy herself elsewhere — take the kids to a park, visit the supermarket — in order to avoid him. On top of this, she is feeling overwhelmed by motherhood and is resentful of friends who have better support networks in place. Bonnie’s mother, Suzanne, is very hands off and despite living close by only sees her grandchildren for an hour a week — at the swimming pool. There’s an unspoken tension between mother and daughter that resonates off the page. And there’s tension between Pete and Bonnie, too. Neither has the gumption to confront Doug and to put boundaries in place — Bonnie writes her feelings off as meanness and admires Pete’s generosity in helping a friend. But by never addressing the issues at hand, the issues continue to simmer unabated. They only threaten to boil over when Bonnie takes up an opportunity to play in her old band for a one-night-only performance — in Sydney. Here, back up on stage, doing the thing she loves, and then celebrating at a boozy after party, Bonnie must weigh up her current life as a stressed-out mother with her past life as a free spirit. Has she made the right choice? Is motherhood — and her relationship with Pete — worth the effort? Frew’s depiction of both motherhood — messy, chaotic, overwhelming — and the music business — chaotic, exciting and fun — are exceptionally authentic, probably because she has experience in both: she was formerly a bassist in the indie band Art of Fighting and later left to have children. Her prose style is effortless, although some of the dialogue occasionally feels stilted and over-explained. And the third-person narrative brims with tension as the sense of dread builds and builds. It works because you’re never quite sure if the paranoia is all in Bonnie’s head or whether her concerns — about her mother, Doug and her marriage — are legitimate. The characters are all well drawn, believable and flawed. As they cruise on through life in their impassiveness — “It was easier just to press on like this, to retreat into wounded distance” — Frew demonstrates how quickly normal life can unravel before anyone realises the damage that has been done. 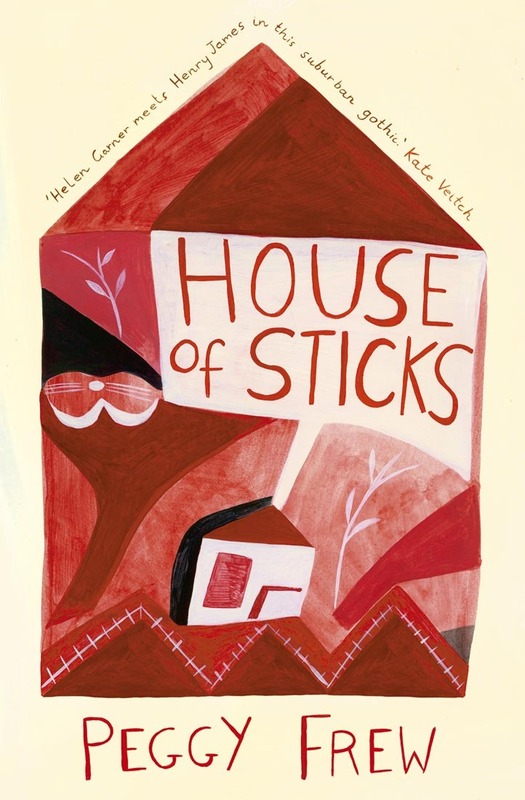 As a portrait of domestic bliss tinged with paranoia, House of Sticks is a top-class read. The situation that you describe is becoming more common in this economy. There are several advice columnists that I read here in the US. Many wives write to complain about a male friend or relative of the husband who comes to stay for a few days and refuses to leave! It seems that the male person likes to be taken care of and not be responsible for anything. The person usually gets upset if asked to do a little gardening or cleaning up. I was thinking I “might” like this one, but now you’ve convinced me so I’ve put it on my list. I know you will like The Trout Opera (which is nothing like this) when you get around to it!! I have just finished another Australian novel – Charlotte Wood’s “Animal People” – which was very good. Razor sharp characterisations that you will enjoy and you will certainly “know” some of these people who appear in her book! A very quick read – but worthwhile. I’ll get around to The Trout Opera at some point, Kate! Glad to hear that Charlotte Wood’s new book is good — I read one of her novels (The Submerged Cathedral) earlier this year and really enjoyed it. It’s one of those books that has stayed with me. In House of Sticks Doug’s presence is more a test of loyalty (and generosity) than anything else: at what point do you help friends that may, in fact, be parasites? Hmm yes this sounds like it could be rather a good read. I wonder if it will get a UK publisher proper (you know what I mean), I hope so and will look out for it if it does. Thanks Kim.